According to a leaked presentation slide on China’s social network Weibo, various Lenovo’s smartphones will start receiving the Android Marshmallow update in March next year. In addition, the K3 Note Chinese edition will also be getting the Lollipop update in January. 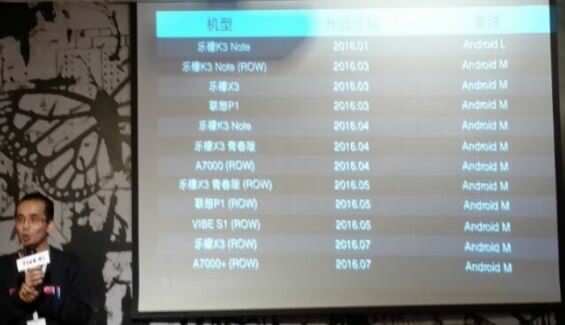 According to the slide, the international K3 Note and Chinese variants of theLenovo Vibe P1 and Vibe X3 will be the first phones to get the Marshmallow update in March. In the next couple of months, the international variants of the A7000, Vibe P1 and Vibe S1 will get to taste the latest iteration of Android. And finally, by July, the international editions of the A7000 Plus and Vibe X3 will get the update. There’s no word on when the other smartphones and tablets from Lenovo will be getting the Android Marshmallow treatment. The brand is expected to officially reveal an exact time frame of the update in the coming weeks, so stay tuned.